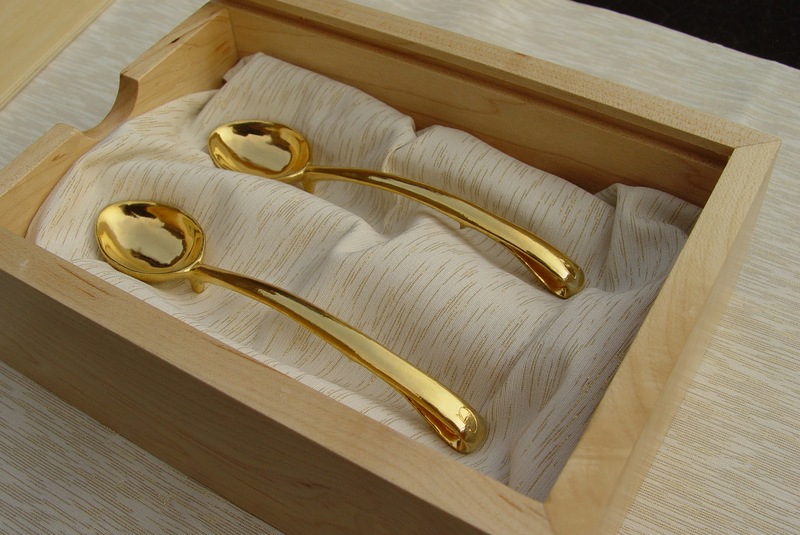 I was recently commissioned to make a pair of 24 K gold spoons as a wedding gift for a couple who are home chefs. The concept was to create spoons for them to experience the last, most perfect taste before serving the dish. 24 K gold is a material considered to impart the least amount of flavor or adverse reaction with food. The handles are designed with a loop so the pieces can be worn around the neck, and with a rest so they can sit flat without touching the surface below. Each spoon is hand engraved with an initial and special animal character for each person. I hope they enjoy many perfect tastes for many years to come! These pieces were lovingly created using Fairmined gold.